"We are a walk-in wine bar." Sure, but for a walk-in wine bar, you have an awful lot of tables. Nope, you're definitely a "barstaurant", Poly – a hybrid that signals ever more flexibility in our already supple dining scene. 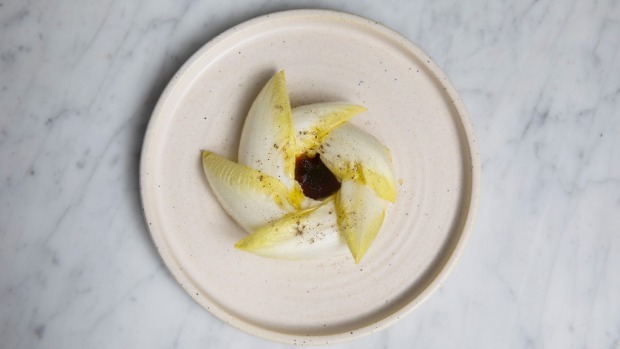 Think Paper Bird, A1 Canteen, and its own sister restaurant Ester, and Poly fits right in. 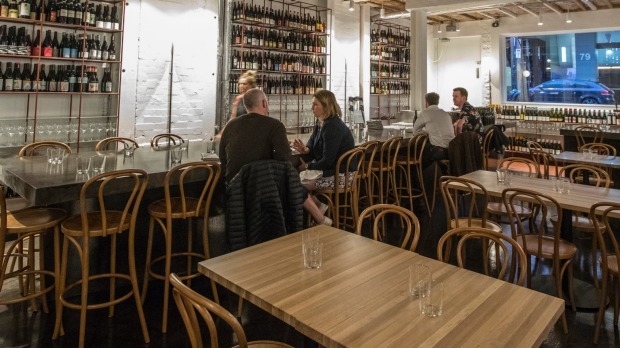 There's table service, a fairly punk kitchen that glows with grills (all coals, no gas), and a printed but ever-evolving menu of grilled yabbies, racks of lamb, and chilli-licked pippis. Or not. Like I said, it's ever-evolving. Anthony Gill Architects has fitted out Poly's spartan semi-subterranean space with, well, not much at all. Long lines of wooden communal tables, a few two-tops along the side, bentwood chairs, natural textures, loads of concrete. Pipes wrapped in shiny metallic foil, exposed insulation. The sort of interior that a builder would quote you three weeks' work to finish. At the rear, flat-capped owner/executive chef Mat Lindsay and head chef Isabelle Caulfield stand calmly in the kitchen, moving food from fridge to grill and from grill to racks set under the vast hood. Their menu is short and heavy on the snacks, but don't get attached to anything. Ever-evolving, remember. I'm hoping the freebie snack of puffed buckwheat will evolve outahere soon, as the gritty little husks get stuck in your teeth. Salt and vinegar haystack onion rings ($10), on the other snacking hand, are divinely salty and drink-inducing; so frail they snap as you lift them. Flavours are big and bold, carried by fat in all its forms – duck fat, butter, oil, cheese. Flat garlic bread ($8) is warm, puffy and smells good, stuffed with a green mulch of young garlic. Blood pie ($12) hails from an impressive bloodline, heir apparent to Ester's renowned blood sausage sanga. 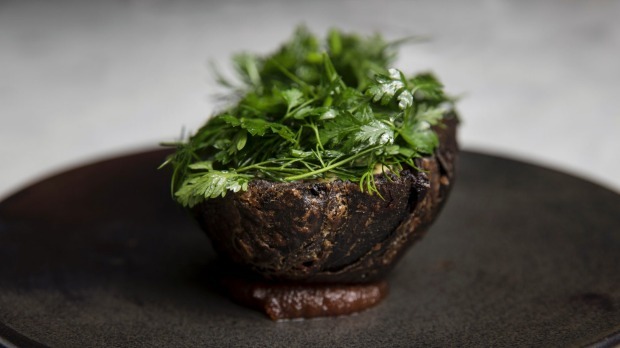 A tennis ball of earthy black pudding wrapped in dark, malty rough-puff pastry, it comes with splodges of mustard, and a frizz of herbs. Ridiculously good. 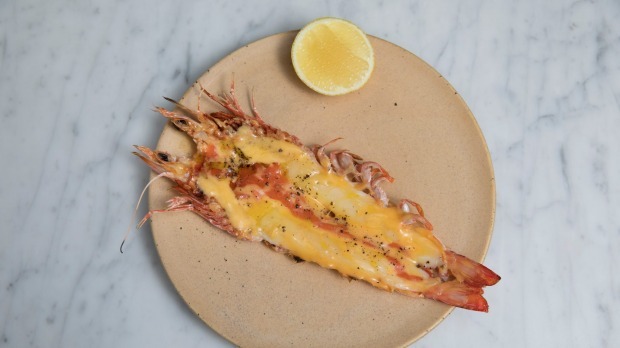 So too, is a single king prawn ($12), split grilled and slathered with buttery, golden duck egg yolk, cured with salt and sugar. So too, is ricotta gnudi ($22) in smoky buttermilk whey butter, hiding under an igloo of leeks. There's one full-on share dish – a giant, fall-apart beef short rib ($42), slow-cooked until the gnarly skin is like sweet jerky, umami'd up with a fungal almond miso, swimming in oily juices. Duck fat caramels ($2) are crazy-rich, crazy-sweet. 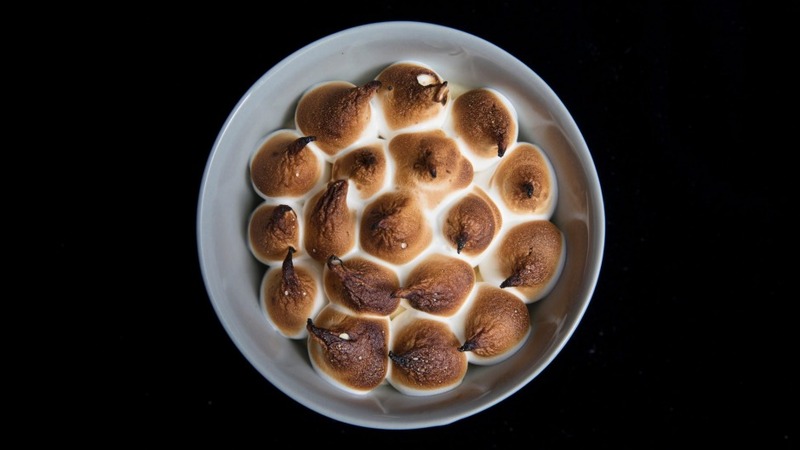 Don't do them AND a so-called queen of puddings ($15), all milk cake and coffee, chocolate mascarpone and meringue. And don't do them both AND the Brillat Savarin ($18), a genius cheese course that's all triple-cream squish and bitter orange syrup under crisp witlof. For a wine bar, drinks seem to take a back seat to the food, but co-owner/somm Julian Dromgool fights back with a genuinely interesting list of wines that produces a balanced, burgundy-like Garnacha from Madrid, La Bruja de Rozas ($90). There's something very relaxed and natural about Poly, and how it lets you use it the way you want – for a snack, a feast, a late-night cheese platter. Its name, of course, suggests more than one (polygon, polygamy), so yes, it's a wine bar, and a restaurant and whatever you like, as many times as you like. Vegetarian: Enough to make life interesting, from salt and vinegar haystack onions to beetroot, labna and Davidson plum. Drinks: Think biodynamic, organic, natural and global; 20 by the glass, 10 sake, and Marrickville's Wildflower beer on tap. Pro tip: Drop in for a late-night cheese course and a drop of something interesting.